Distribution: Slender Orcutt grass is endemic to California and has been found in Butte, Lake, Lassen, Modoc, Plumas, Shasta, Siskiyou, and Tehama Counties, with the southernmost extent of its current range falling in Sacramento County. Occurrences of slender Orcutt grass are concentrated in the northeastern portion of the Sacramento Valley and on the Modoc Plateau. It is not known to grow in the Natomas Basin, but appropriate habitat exists in the vernal pools along the basin’s eastern edge. The closest known occurrence is approximately 12 miles (19 kilometers) southeast near the city of Rancho Cordova. Habitat Requirements: Slender Orcutt grass grows in the drying clay substrate of relatively deep vernal pools and swales. It is found at elevations of approximately 120″“5,800 feet (35″“1,750 meters). 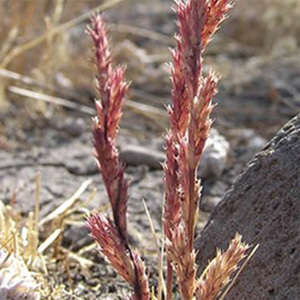 Demography: Slender Orcutt grass is a small annual herb in the grass family (Poaceae) that blooms May through September and sometimes in October. It is one of the latest blooming members of the Orcuttieae tribe, and it grows in the thickest stands. This dense growth habit may have evolved in conjunction with grazing impacts, both to defend against trampling damage and to keep other plants from gaining a foothold following grazing. It has been theorized that the seeds of slender Orcutt grass require fungi to germinate. Like other Orcuttieae, slender Orcutt grass releases a sticky and odorous fluid that coats the leaves, protecting the plant from drying out and making it less palatable to grazers. Slender Orcutt grass often grows in association with various Downingia species and Fremont’s goldfields (Lasthenia fremontii).